MSN Virus Cleaner allows you to clean and remove MSN threats including worms and viruses from your MSN or Windows Live Messenger. 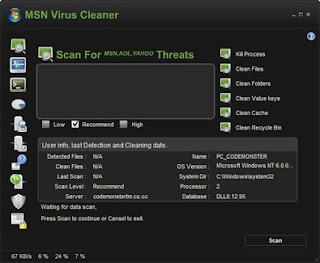 MSN Virus Cleaner can even remove AIM and Yahoo! Messenger related viruses and worms. Its recommended that you use an extra antivirus softwar.. MSN Virus Cleaner can not detect threats other than MSN viruses. MSN Virus Cleaner works with Windows XP, Windows Server 2003, Windows Vista and Windows 7.